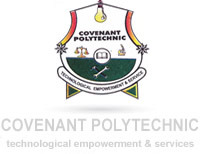 The Covenant Polytechnic, (CPA) Matriculation Ceremony Schedule for all Newly Admitted National Diploma [ND] and Higher National Diploma [HND] Students for the 2017/2018 Academic Session Has Been Announced. This is to inform all newly admitted students of the Covenant Polytechnic, (CPA) that the matriculation ceremony date for the 2017/2018 academic session has been announced. The Matriculation Ceremony is schedule to hold on the 3rd of May 2018. All Freshmen are pay N3,000 their matriculation gown. Matriculation exercise is compulsory for both newly admitted into HND and ND. All newly admitted students into HND should collect their Matric number starting from Monday, 9th April, 2018. All management students in Osisioma campus should go to former E/E campus to collect their Matric number. Collect your matriculation number as 1st semester examination will start immediately after Matriculation.